What exactly do I mean by Extra SEO Goodness? The enhancements in Vine Type version 2.2 provide three new significant Search Engine Optimization (SEO) feature improvements. Being friendly to Google and other search engines is a necessity on the internet. You want your website to be found and indexed easily -- providing the information the search engines need to categorize the information your website provides. 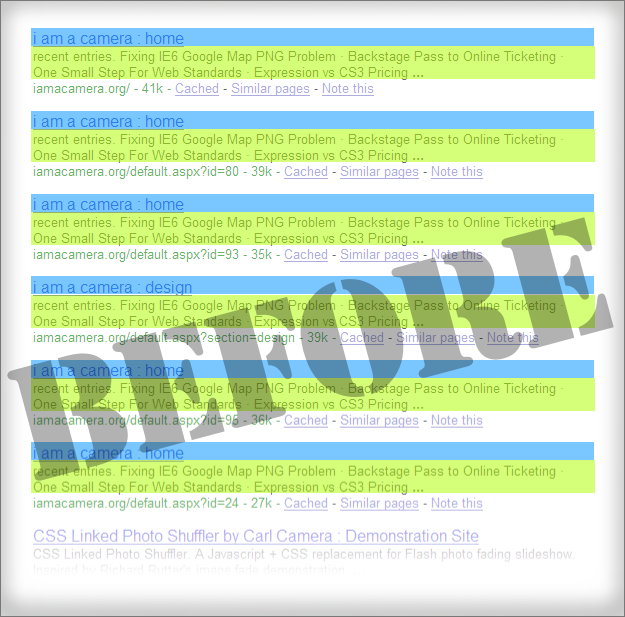 The biggest feature improvements provide enhanced search result titles and descriptions for your site. 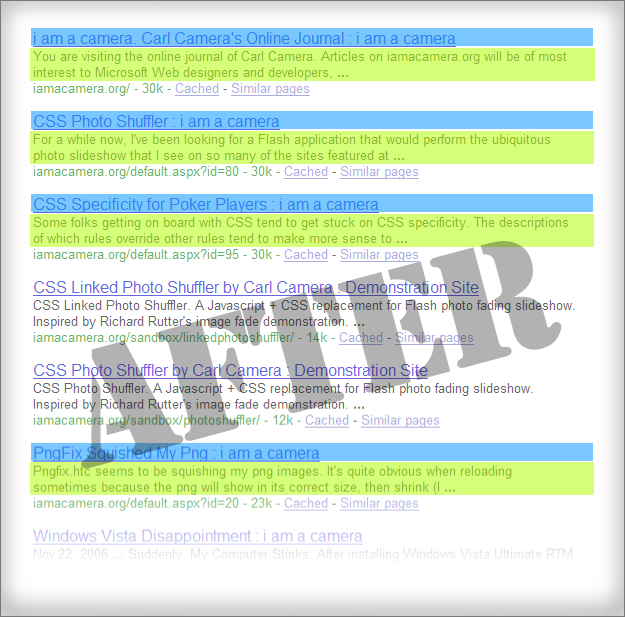 Prior to version 2.2, titles were mostly static, and per-article descriptions were non-existent. Now, by placing the $_articletitle_text variable in your title tag and the $_article_summary variable in your meta description tag, search engine visitors are more likely to see what they are looking for. Take a look at two Google searches for the same Vine Type site before version 2.2 and with version 2.2. Before version 2.2, all the article titles and summaries looked very similar. After version 2.2, the difference is dramatic. Titles are meaningful, and the descriptions (the first several words of the article) provide a clear indication as to what will be found when the link is clicked. Pro users of Vine Type will also benefit from the search engine sitemap provided by version 2.2. Prior to version 2.2, Vine Type served up Google sitemaps, but now serves up a similar industry-standard version for Yahoo!, Live Search, and other search providers. You might not initially equate missing page support with search engine goodness, but search engines are very interested in knowing when pages have been removed, so that those pages could be removed from their index. Vine Type previous to version 2.2 issued visual 404s - blank pages when an article or section was deleted or moved. Visitors understood their bookmark should be changed, but search engines would continue to index the old page thinking it was still in existence but now blank. This situation can lead to considerable search results clutter. By providing true 404 support, Vine Type version 2.2 sites will clearly communicate to search engines whether pages are and are not present.